Debbie Macomber returns to the world of New Beginnings to give readers the story of Nichole Patterson, sister of Cassie Carter, heroine of Last One Home (2015), and Leanne Patterson, Nichole’s mother-in-law. When Nichole filed from divorce from her husband Jake after discovering he had been unfaithful and his current paramour was pregnant, Leanne finds the courage to follow suit and divorce her husband of thirty-give years, no longer willing to tolerate his serial cheating. The women take modest apartments across from one another in a Portland complex and begin adjusting to a life very different from their experience as half of a country-club couple. Realizing how easy it would be to sink in a sea of anger, depression, and self-pity, the two draw up a list of steps to survival in their new world. They call it “A Girl’s Guide to Moving On” and work hard at following the rules. The first “do” on their list requires them to reach out and do something for someone else. Nichole volunteers at Dress for Success where she helps other women who are hoping for a second chance at life. Her work at the shop quickly becomes a meaningful part of her new life. The same is true for Leanne who teaches English as a Second Language classes. Through a minor automobile accident, Nichole meets Rocco Nyquist, owner of a towing company. Rocco, the single father of a fifteen-year-old daughter, offers Nichole a deal. If she helps his daughter Kaylene find a dress to wear to a dance that Kaylene likes and Rocco is willing to let her be seen wearing, he will tear up the check Nichole wrote for his towing service. Since Nichole is pinching pennies on her new budget, it sounds like a great deal to her. Soon she is dealing with the attraction she and Rocco share and finding her relationship with Kaylene has its own rewards. Rocco touches her heart with his genuine caring for her three-year-old son Owen. Leanne too meets a new friend, one of her students, a Ukrainian baker who courts her with fresh-baked bread. But both Nichole and Leanne discover that old ties can complicate new relationships. There are many things I liked about this book. Macomber does an excellent job of showing all the difficulties in ending a marriage. Like most women in their situations, Nichole and Leanne must deal with a cut in income, but that is less significant than the emotional pain of crushed dreams, low self-esteem, and connections that cannot be severed by signing a paper. There are also the pragmatic considerations such as learning to take on tasks that the former spouse once did. Nichole’s divorce is even more complicated because Jake drags out the process for two years and because she and Jake must deal with long years of co-parenting. As with most Macomber novels, I enjoyed her portrayal of women’s relationships. Nichole and Leanne, although former in-laws now, share a touching friendship and a mother-daughter relationship as well. They both have other friends, and then there are Nichole’s sisters. As a big fan of the first book, I loved that Cassie and Steve’s wedding is included in this one. I didn’t like the implication, perhaps unintended, that working class men make better, more faithful husbands than men who wear suits. Rocco is a great guy, and Jake is a jerk, but I don’t think their character differences are rooted in their educational levels or their occupations. And I could never see Leanne and her baker as soul mates. If you like sweet stories that blend women’s fiction issues with romance, you should enjoy this book. 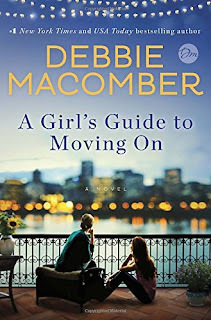 If you are one of the multitude for whom Debbie Macomber’s name on a novel is enough to make you happy, I can promise the book will leave you smiling. I always love Debbie's books. Thanks for the review.